Mitsubishi has always been a company of innovative vision. In 1975, Mitsubishi Power Systems developed and produced turbine power generation systems. If you think about it, it had only been a few years earlier that the first “Earth Day” had occurred, but Mitsubishi was looking into the future of renewable energy power sources, and began a process that has made them a leader in the industry today. It was in 1980 that Mitsubishi made deliberate and clear strides above any other company at that time in the development of high efficiency wind turbines for renewable energy use. Mitsubishi is an incredible company. If you know anything about them, you realize it is a parent or ‘umbrella’ company with many unique divisions under the parent company name. Each division is a specialist unit and, in some cases, may never have or need to communicate or work with the other divisions. From automotive to satellites, the various divisions have an incredible array of professionals within each field that keep each division running at peak efficiency and capacity. The Power Division creates long term renewable energy solutions with the production of the turbine power. Turbine power is one of nature’s most available renewable energy sources. There are turbine power farms appearing all over the world. 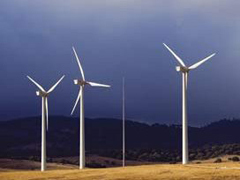 Tall turbine ‘trees’ that are linked together with computerized controls and convert the power of the air and wind into usable electricity for residential and commercial use. Mitsubishi has perfected their wind turbines with a current choice of six models. From a 1,000 kw with a 60 meter tower to the 2,400 kw on an 80 meter tower, each model offers a variety of abilities, based on the need, wind speed, pitch, velocity, blade length, and performance curve. Mitsubishi has U.S. plants in both Savannah, Georgia and Orlando, Florida with a Houston, Texas Outage Resource Center. Installations of the wind turbines are peppering all across the United States and the world. The successful install in Arkansas has even added that state to the list of some of the most successful ‘green’ states in the country. From Oregon, California and Texas, the state of the art Mitsubishi wind turbines are appearing in the U.S. with Germany and the United Kingdom topping the charts for their use in Europe. While there have been some nay-sayers on the topic of wind turbines regarding the esthetic appearance on a landscape, the overall success as a renewable energy source has overtaken any negative feedback. The wind turbine farms are usually located in very remote areas of the country, typically only visible if you take a back road. In some cases, turbine farms can be viewed from a main highway, but they are usually at a distance on hilltops. There is also a great amount of research that goes into ensuring that the installation of wind turbines will not cause any ill effects on the ecological balance. Mitsubishi started their vision when everyone else had blinders on to the global need for renewable energy and must be congratulated for taking that bold step and continuing on to the achievements of today. Posted on February 10th under Alternative Sources of Energy, Wind Energy Systems.